You are not likely to meet a more outspoken character than the genuine king of the ring and don of all promoters ... Don King. I was at Madison Sqaure Garden on another big fight night chasing a vague promise of five minutes with the most famous hairstyle in boxing. Half an hour after he entered the room, the anecdotes were still tumbling, the smile was broader than ever and I'd barely been able to get a word in. 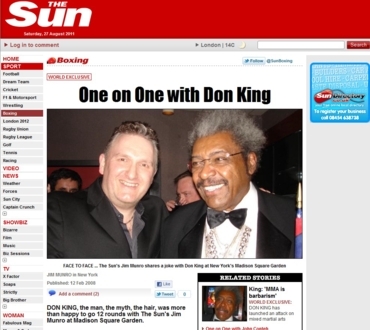 Click here to read Don King on The Sun. Softly spoken, the gentleman of the ring told me he earned 35 MILLION dollars for the nine minutes of boxing in the infamous bout with Mike Tyson, which also cost him a piece of his right ear. I asked him whether he resented Tyson for biting a chunk out of him. Holyfield smiled and answered: "I was saying to myself, 'he can bite this one for $35million too'. 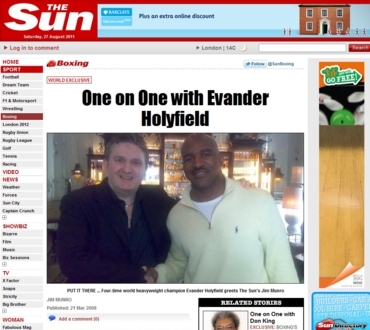 Click here to read Evander Holyfield on The Sun. As a boxing fan I was in awe of Nigel Benn, not because of some special talent that made him tower above the rest, but because of his sheer bloody determination to fight on until it was physically impossible for him to stand. Nigel Benn v Gerald McClellan remains one of the most bloody, brutal and tragic encounters in boxing history. It was a pleasure to report on Benn fighting for a world title and even more of a thrill to catch up with him in retirement to look back over his explosive career as the Dark Destroyer. 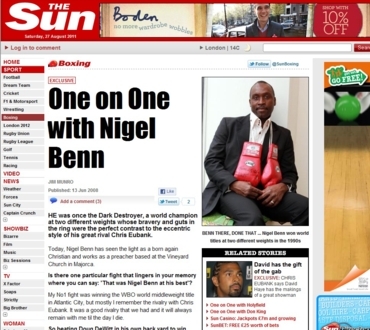 Click here to read Nigel Benn on The Sun. DAVID HAYE'S manager Adam Booth suffered a gash to his forehead as his fighter brawled with Dereck Chisora after an ugly confrontation in Germany. 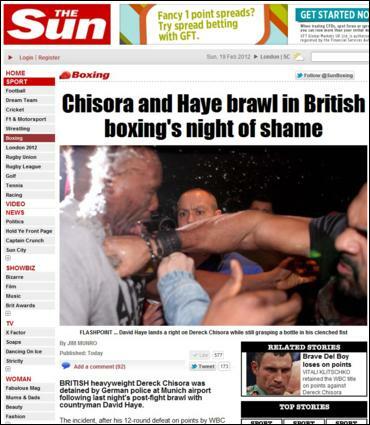 In an incident that has brought shame on British boxing, the two heavyweights came to blows in a post-fight press conference following Chisora's 12-round defeat on points by WBC champion Vitali Klitschko.As members of both camps and the attending press tried to break up the melee in Munich's Olympiahalle, Chisora could be heard yelling "he glassed me" before screaming at Haye: "I swear to god David, I'm going to f****** shoot you."